The cemetery, out my car door, and across the hood. The cemetery is located at Cranbrook, Concession 11, Grey Township. When I arrived at this place in May of 2001, it was truly a spiritual experience. It was satisfying to stand at the graves of both sides of my grandmother’s family. I later found that a cousin had visited during his lifetime, but that was 40 or 50 years previous to my visit. I had no idea of what I would find, and the discovery of my ancestor’s names in the indices in Goderich and the subsequent trip to the cemetery was very exciting. This post will show the Kaiser side of my Grandmother’s family. 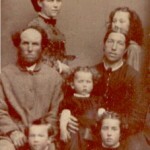 My 2nd great grandfather, William Kaiser, and his family resided in Grey, Huron, Ontario, Canada from at least 1870 forward. I do not know the exact date the family arrived in the area. The three children of William Kaiser and Elizabeth Long who died while the family resided in Grey Township are buried here. There is one stone which had been broken off and subsequently repaired. The cemetery was well kept and neat. Although I have no idea when the Kaiser marker was damaged and repaired, I am grateful that it remained for me to see and photograph.